Before you make the final decisions on a waterproofing system for your floor, walkway, deck or patio, before you “seal the deal” so to speak, think about texture. Yes, that’s right, texture. Enhance flooring projects one step further than just waterproofing with texture coat systems. Options for a patterned or textured finish will add visual appeal and further customize the look. It’s as easy as selecting a pattern or texture then choosing a custom color. The appearance of knock down texture adds subtle depth to what would have otherwise been a flat, smooth surface. It also makes it easy to disguise any flaw or imperfection. Particularly popular throughout the southwest U.S., the rough surface of strong peaks is commonly associated with the design style of rustic adobe. The name of the finish is odd but once you know how the texture is created, you will understand how it got that funny name. To create the effect, typically a craftsman will add water to joint compound until a thick soup is created. Using a hand trowel to apply the mud-like mixture, stalactites will form as the mixture oozes, drips and travels the path of gravity. After drying the craftsmen uses his trowel to “knock down” the stalactites thus creating the final textured surface. Although similar in some regards to Knock Down, the three-dimensional aspects of this texture are more subtle. It has a gentler aspect to the effect of peaks and ridges that re-create an Old World inspired finish. As in the knock down finish, a hand trowel is used in this technique that will accentuate even the lightest shade of pigment. Applying a very thin layer of compound mixture the edge of the hand trowel is used to drag the mud across the surface in a skipping motion to create the effect. Originally sand finish was performed in plasterwork to create what is commonly called a stucco finish. The final effect is a surface that has the appearance of a fine aggregate such as sand. 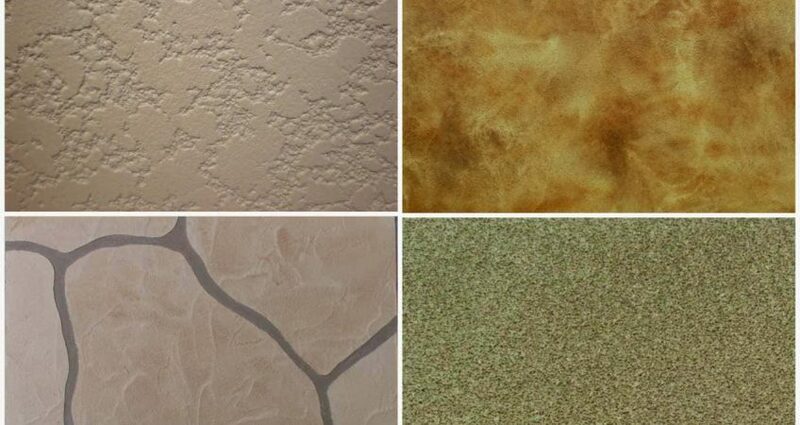 Sand finish, or stucco, has been around for centuries and is more versatile than most people would believe. Old school sand finish was created by mixing lime, sand and water. Modern recipes are typically a blend of the same with some cement tossed in. There are a number of variations that will result in a smoother or rougher appearance to the final texture. Application of the texture can be done the old fashioned way, with hand and trowel. However, more often than not, a craftsman will apply the mixture as a spray. Many finish options can upgrade the appearance of concrete flooring, indoors and out, to recreate the beautiful, traditional aesthetics of marble or other fine stone such as terra cotta tile, brick or flagstone. A wide variety of template patterns are available: slate, cobblestone, or cinder block. Brick finishes also feature a wide variety of lay patterns: herringbone, Chicago style, or jumbo sized. The finish is applied to the surface of the concrete with a stamp method. The term “stamp” may be a bit of a stretch. There is no licking and laying down of adhesive vinyl patterns like a postage stamp. There is no rolling an office supply in an ink pad to apply a painted pattern onto the surface of concrete. To stamp concrete actually involves the knowledge of a chemist and the skill of a craftsman who likes to “stamp” around a bit. After treating the surface of the concrete with the right chemicals a paving tool featuring the pattern of choice is then applied to the surface of the concrete. Using pressure applied by hands or feet, the pattern is “stamped”, or pressed into, the surface of the concrete. After the pattern sets, color and sealant is applied. If you have made the decision to create the beautiful floor, walkway or patio of your dreams, please contact us. With more than 35 years of experience creating waterproof projects that are a thing of beauty, we have the quality coating products to make your dream project come to life.